LEO Solid Pine Childrens Bunk Bed Fixed Ladder 3ft Single. 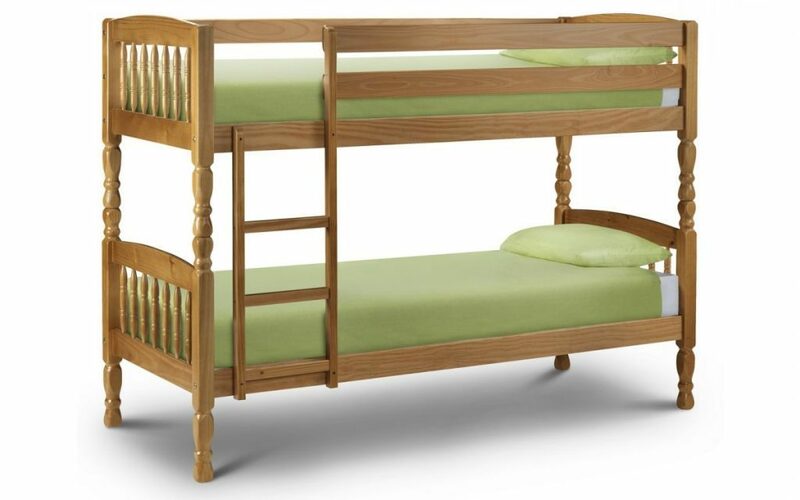 Home Beds & Mattresses Beds LEO Solid Pine Childrens Bunk Bed Fixed Ladder 3ft Single. The Leo bunk bed is fresh and versatile. Giving you two single beds in one space. With its clean contemporary design with turned spindles and versatile fresh antique lacquered finish the Leo bunk bed is as good looking as it is sturdy. The Leo bunk is available in 2 different sizes, 76cm small single or 90cm single. Has a fixed ladder which cannot be moved, Safety railings to help avoid night time tumbles. The bunk bed also features slatted bed bases. Mattresses are not included but see our mattress section for more details. These bunks have a classic design with a clean, fresh antique pine lacquered finish making them highly versatile. Perfectly fitting in to a variety of different rooms and coordinating perfectly with existing décor. The Leo bunk is very resilient, even for the most active of children.